Reliance Jio has again starting giving out free data to its users as part of its Jio Celebration Pack. As part of this, users are getting additional 10GB 4G data with a cap of 2GB per day. Readers must note that this 2GB per data is over and above the existing plan that the Jio users have. and is reportedly being rolled out to random users with varying validates for 5 consecutive days. Readers must note that the Jio Celebrations Pack was announced back in September on the occasion of Mukesh Ambani-owned Reliance Jio's second anniversary. 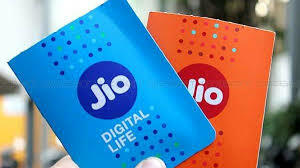 Recently, Reliance Jio has introduced two new recharge plans for Jio Phone users only. Both the plans offer long term validity and are priced at Rs 279 and Rs 594 respectively. The new Rs 297 recharge plan offer 84 days validity while the Rs 594 plan comes with 168 days validity. Along with unlimited free voice calls, the plan will offer 0.5GB high-speed data per day with a cap of 84GB for the Rs 594 plan and 42GB for the Rs 297 plan. Both the plans will offer 300 free SMS every 28 days along with access to regular Jio apps. IF I DID NOT GET WHAT I HAVE TO DO? Reliance Jio is Fooling people...there is no such a plan after being a regular customer..